Hahahaha I believe that you do like bacon! DUE TO THE GULF OIL SPILL, FISHING HAS BEEN BANNED IN LOUISIANA WATERS. THE SHORTAGE OF SEAFOOD HAS PROMPTED LOUISIANNA CHEFS TO CREATE 'ALTERNATIVE RECIPES ' TO SATISFY THE CAJUNS DESIRE FOR SEAFOOD. Here's a new twist on how to serve burgers and if you don't cook, give this handy little guide to someone that does and request them. 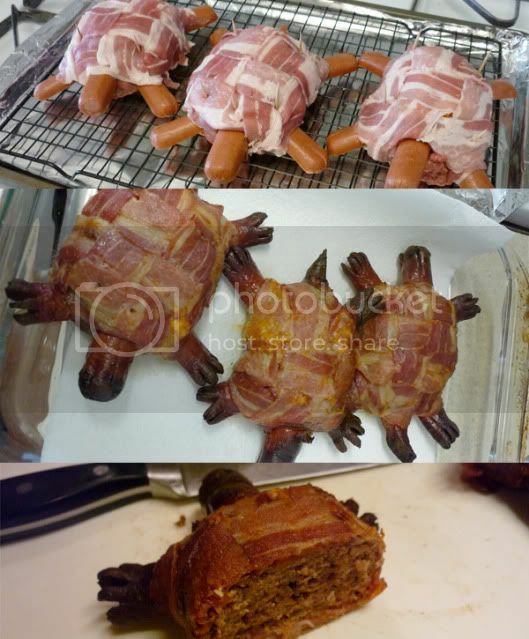 Handmade ground beef patties, topped with sharp cheddar cheese, wrapped in a bacon weave, then the next step, add hotdogs as the heads, legs with slits for toes and tail. Next step. Place on an oven rack, covered loosely with foil and baked for 20-30 minutes at 400 degrees. A little crispy, not too crunchy...just how a turtle should be, no? Justin Wilson would have been proud to partake, of course he would have had some cold drink with it. I am SO gonna try that!!!! I like almost any meal which includes three different kinds of meat .... add a tater of ANY kind, what more could ya want??! !